BioArctic AB (publ) is a Swedish public limited liability company, org. No. 556601-2679, with its registered office in Stockholm, Sweden. BioArctic’s B-share (BIOA B) is listed on Nasdaq Stockholm since October 12, 2017. Corporate governance refers to the rules and decision-making hierarchy that contribute to the efficient and controlled management of the operations of a company, with the aim of meeting the owners’ demands for return on the invested capital. Corporate governance in Sweden has traditionally been regulated by law. In addition, the industry’s self-regulatory bodies have continuously presented various provisions concerning corporate governance. Companies listed on a regulated market shall apply the Swedish Code of Corporate Governance (“the Code”) issued by the Swedish Corporate Governance Board. More information on the Code is available at www.bolagsstyrning.se. Corporate governance in BioArctic is based on the Swedish Companies Act, BioArctic’s articles of association, Nasdaq Stockholm’s rules for issuers, the Code, and other applicable laws and regulations. Also internal rules and instructions affect BioArctic’s corporate governance, e.g. the rules of procedure for the board of directors, instructions for the CEO, instructions for financial reporting, and other policy documents within the Group. BioArctic aims for a high standard by clarity and simplicity in the management system and governing documents. Governance, management and control of BioArctic is divided between the shareholders at the Annual General Meeting, the board of directors, the CEO and the auditors in accordance with the Swedish Companies Act and the articles of association. Through increased openness and transparency a good insight into the company’s operations is provided, which contributes to effective governance. BioArctic applies the Code since the listing on Nasdaq Stockholm on October 12, 2017. No deviation from the Code has occurred. 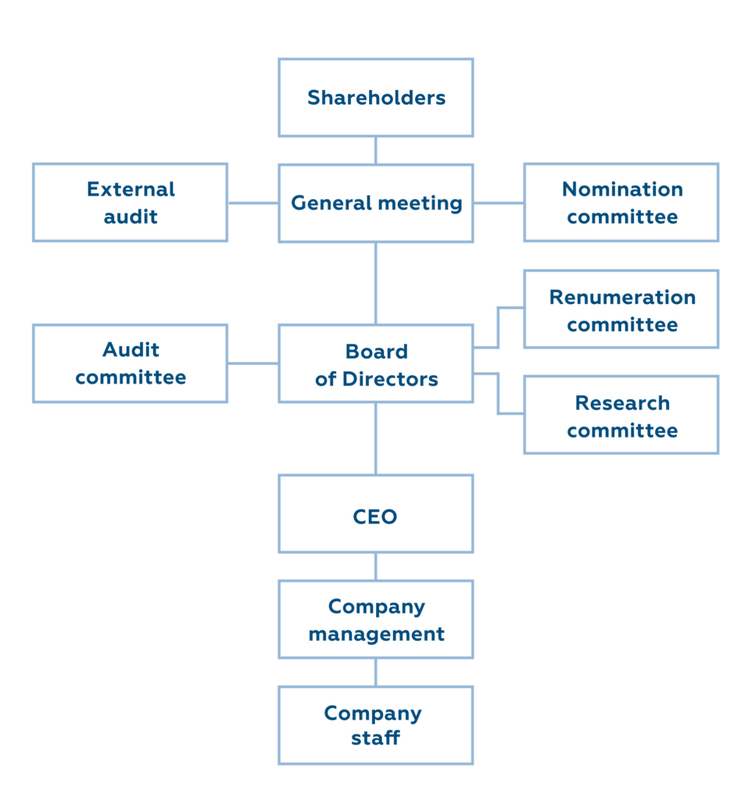 The figure below provides an overview of BioArctic’s corporate governance structure.